The coffee tables are the basic concern while having a matter of living room organization in hand! Interested in doing things with your own hands? 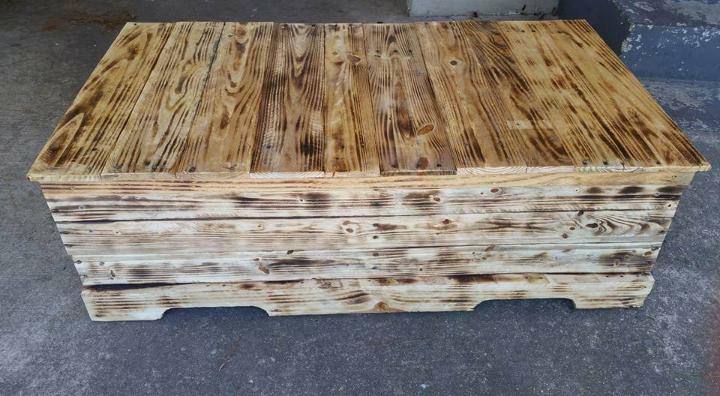 If yes, then you can build lasting longer coffee tables in a matter of seconds! 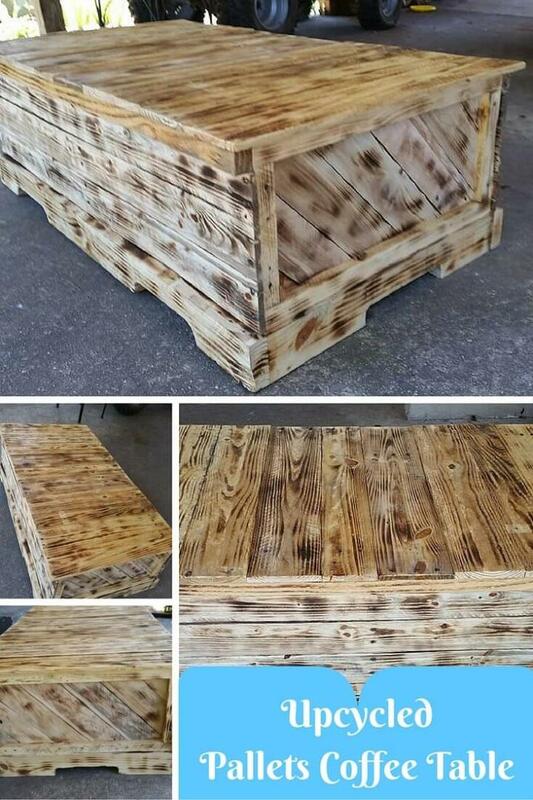 Checkout this one more latest sharing of DIY projects, the DIY pallet scorched coffee table inspired of a chest design and is too beefy and sturdy to live for many years to come! Design can be hired for various other functions as it can employed as a bench if the user likes to sit on it, by giving it a solid bottom and a hinged top lid, you can also avail it as a storage chest! 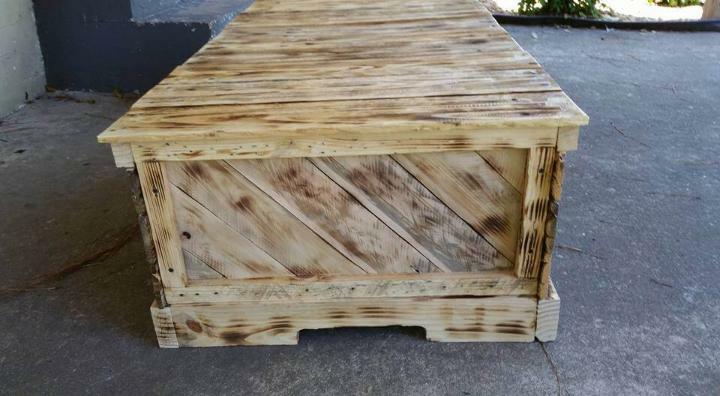 Bottoms lining and boundary has wholly been done with removed pallet stringers having some cuts in the shape and also serve as the stable feet to whole coffee table design! 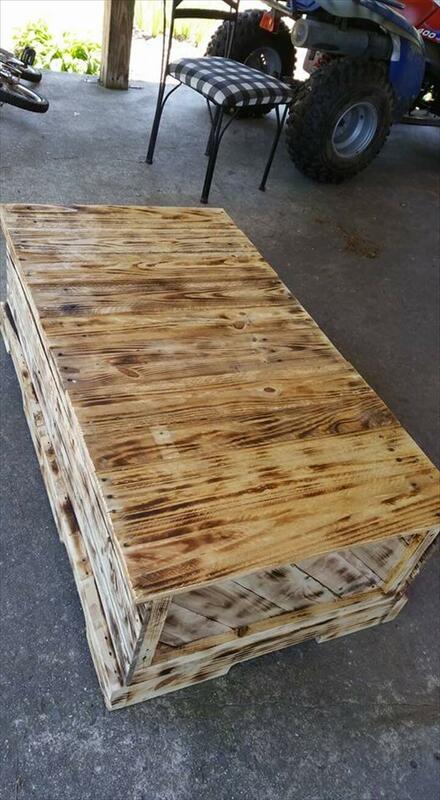 Scorched look has been created through undergoing a complete wood burning process that make the entire pallet coffee table look antique and mid century inspired! Put together some stripped apart pallet slats and build the base of the table just like a hollow wooden square, install the more removed slats to built a tabletop and let the pallet stringers be the feet of the table! This table has been built in XL dimensions hence would get your first priority while having an occasional matter of guest entertainments in hand! Sides of the table has been installed in a diagonal stripe pattern and provide peak-value focal stimulation to entire design of the table! 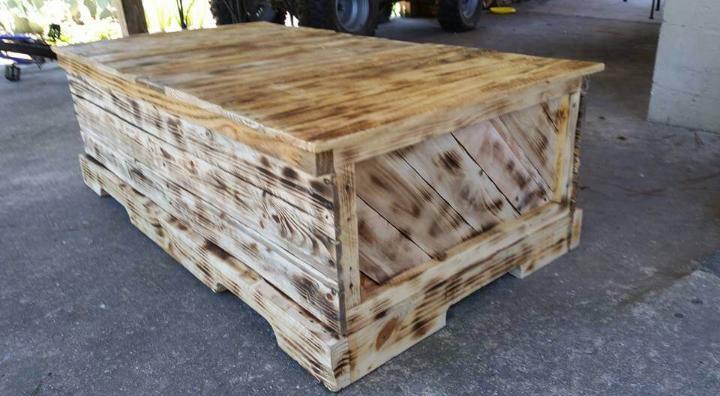 Table can also be employed as a storage chest with few more modifications and readjustments! To move this heavier wooden mass easy move to either direction of your patio, one can raise it on wheels! While being at your patio or in garden, this tangible wooden table can also be hired as a sturdy backless and arm-less bench to fulfill the sitting space demands of your garden or outdoor space! By burning the wood, the damn hot and fab scorched look has been created that also give the more defined lines and eye-capturing details to wooden surfaces, boundaries and edges! Nails has been added to fix the planks in place and to get the finally finished wooden table that will not die early! Stain, varnish and paint can also be used with a mix sealant solution to create more stability, water and weather proofing to wood!